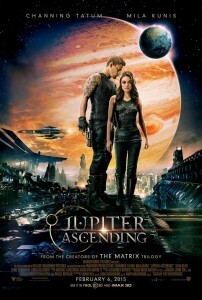 If Jupiter Ascending were a person, they’d be schizophrenic. The film is a convoluted and disjointed mess that even top-notch visuals can’t save. To say the film is a waste of your time would be an understatement. If that ringing endorsement doesn’t catch your attention, then continue on dear reader. To start the convoluted story is a convoluted backstory, following Jupiter Jones (Mila Kunis), a Russian immigrant who despite her model good looks is stuck cleaning toilets and living with her stereotypical Russian family. Her father was an Englishman (hence the surname Jones) who was shot and killed shortly after Jones was conceived. Presumably this wasn’t a ringing endorsement of why raising a child in Russia is a fantastic idea, so her family immigrated to the United States. As Jupiter faces a lifestyle not befitting her hotness, she is saved by wolf-man genetic hybrid, Caine (Channing Tatum). Caine has been hired to bring her to Titus Abrasax (Douglas Booth), a member of an androgynous space clan regarded as royalty throughout the universe. Unfortunately for Jupiter, his siblings Balem (Eddie Redmayne) and Kalique (Tuppence Middleton) want in on the action as well. Eventually it is discovered that Jupiter is the genetic reincarnation of the matriarch of the Abrasax clan. We are led to this discovery by bees, yeah, that’s right bees. You see bees can sense royalty. I’m not making this up, this is seriously in the movie. So, let’s just go ahead and fly through the rest of the plot details. It’s obvious that the Wachowski siblings didn’t put a lot of thought into it, so I won’t either. Jupiter has to save Earth from Balem, who is a curious mix of Emanuel Zorg and Voldermort, before he harvests the planet for genetic material. The major positive behind Jupiter Ascending is its visuals. It looks fantastic, and could probably result in some pretty wallpaper for your computer desktop. After that there really isn’t anything good to say about the movie. The narrative of the film is so disjointed that characters continually have to explain elements to move the plot forward. This makes for a painfully boring experience that isn’t much improved by the absurdity of the plot. That isn’t to say that underneath it all isn’t a few intriguing elements, but it’s all buried beneath space politics. The number one flaw of the movie is keeping the fantastical elements of a space fantasy, but instead having the plot focus on inter-family space politics. The film goes out of its way to be alien and weird, but it ends up being a Hot Topic alternative, and thus falls into some weird uncanny valley. There were moments during the film where something looked interesting only to be snatched away by some weirder element that left the film stinking of ruined potential. Eddie Redmayne is going to have to hope that this film is buried from public consciousness for a while, because he tops all with his truly awful performance. No one gives an inspired performance, but Redmayne’s eclipses all of them with its highly focused terribleness. The film ends just as terribly as it begins, and leaves us all wishing we had found a better way to spend two hours.